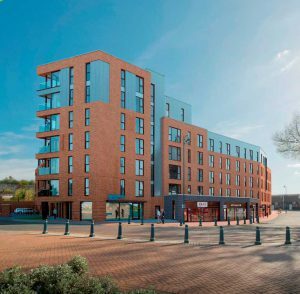 Summers Quay, a flagship residential scheme in Stalybridge, Tameside is due to complete this month (August) with new tenants soon to move in. Artist impression of Summers Quay. The development offers 67, luxury 1 and 2-bed apartments and retail space in the heart of the town centre and more than 75 per cent of homes have been reserved off-plan – including the top three floors and all penthouses. Summers Quay is New Charter Homes’ (part of Jigsaw Homes Group) first private rent project with any profits being reinvested into providing more homes for affordable rent across Greater Manchester. The building is also one of the first residential schemes in the country to be connected up to full fibre through Tameside’s ‘dark fibre’ network. Approximately 11km of fibre cable has been installed through the building to give each of the 67 apartments a direct connection and a wireless router ready to use upon move in. Tenants will be able to benefit from speeds of up to 50MBs for as little as £15 per month through service provider Simply IP. Rents at Summers Quay start from £575 per calendar month (pcm) for a one-bed apartment with a courtyard view and £595pcm for a canal-side view. 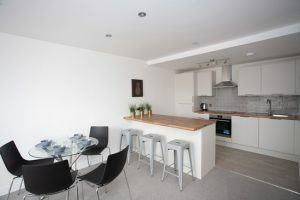 Two-bed apartments with en suites are priced at £675pcm for a courtyard view and £695pcm for canal side. Apartment rental prices include a service charge. 53 car parking spaces are available on-site for a small additional charge and are almost sold-out. Earlier this year, Stalybridge was named as one of the Greater Manchester Mayor’s Town Centre Challenge locations, a new approach to regenerate town centres across the region. Tony Powell, Deputy Chief Executive of Jigsaw Homes Group which New Charter Homes is part of, said: “Summers Quay has attracted a range of new tenants including first time renters, downsizers and commuters looking to live closer to Manchester but without the city centre premiums. Anyone interested in an apartment can contact lettings agents Taylor and Wood on 07483 167 800 to book a show home viewing or reserve.